That elicited some good natured laughs and smiles from the other “Ragnarok” stars on the dais, but make no mistake, Feige had a serious look on his face on the subject. While I hope she was referring to the more recent version of the Lady Liberators and not the cheesy 1970s version. 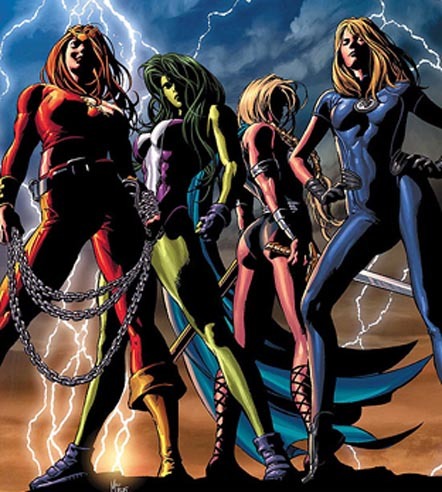 The latter version included Valkyrie as a member, but the team she actually led was the Fearless Defenders. Chances are they'd change that name to avoid confusion with the Netflix series, The Defenders. But I could see something similar happening with a team consisting of Valkyrie, Black Widow, Scarlet Witch, Captain Marvel, The Wasp, maybe Gamora, with Pepper Potts manning the control center? And maybe this could be a way to introduce the female Thor? Hey Natalie Portman, quit blocking Marvel's calls and pick up!